Being a distinguished Manufacturer, Exporter & Supplier of 6 Head Automatic Linear Piston Filling Machine, we attempt to accomplish 100% customer satisfaction. Our wide range of machine is manufactured using first-rate raw material. We meet the highest standards and parameters of quality set by the industry. Designs are made keeping different specifications in mind. The optimum performance, efficient design and longer service life of the machine is available for economical prices. This Automatic Linear 6 Head Piston type Filling machine (AEAPFC061000) is manufactured only with the purpose of multiplying the output of any filling unit, where the requirement of products is very high. A very reliable machine with high output is the main motto of ours during the design of this machine. The result was a great success and satisfied our customers to the maximum. All the operations in a particular sequence in this machine give a feeling of a good orchestra performance during a concert. High efficient machine parts and good technology makes this machine the perfect engine to deliver the best. Any Liquids, viscous/ non-viscous products can be accurately measured and filled in any shaped containers or bottles or even tubes with this machine. High output is the main feature of this design, at the same time, a special facility to increase and decrease the speed is also the most advantage of this machine. 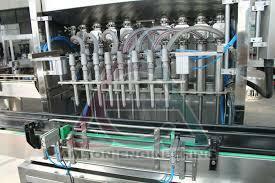 We are assuring an output of at least 100 fills per minute with this four head machine @ 500 ml. Automatic shut-down of machine when not in use. Pneumatic stopping for bottle while filling. Bottle feeding done manually and all other operations are automatic. Linear filling done over conveyor. Batch counting possible when once started. Completely pneumatic operation, so maintenance is low. Diving nozzles ensures internal filling without damaging the mouth. Manual and automatic function provided.